A warm glow covers this painting by the Georgian artist Anna Mgaloblishvili. The soft light of daybreak spreads across the mountain in the background and casts its orange rays across the water, the grass and the face and hands of the man. Darkness is dispelled, a new morning dawns. It reminds me of the words in Isaiah 9: “The people who walked in darkness have seen a great light,” through which the prophet foretold the coming of the child who shall bring endless peace. During Advent we focus our attention on the coming of Christ: then, now, and in the future. It is a time full of longing, self-inspection, expectation and hope. Even though she was not sure why, she knew that she had to paint a butterfly on the hands of the man. It gives this work a poetic flavour, as if we are looking at a small poem in paint. From antiquity the butterfly has been a symbol of the resurrection. This fragile creature grows in concealment, locked up in the dark and narrow space of the cocoon. But when it is full-grown, it spreads its wings and flies away, liberated and in totally new form, into the open sky as an effervescent sign of new life. In the same way Jesus entered the cocoon of the world at Christmas and led the way at Easter in the transformation into a body glorified. The eyes of the man drink in this token of new life that has come to sit on his fingertips, as if he wants to embed this special moment indelibly within his memory. After all it will only be a few moments before the butterfly will disappear out of sight again. Now and then we receive glimpses of God’s presence. Sometimes we do not know whether we should believe our eyes, just like the author of the poem. I want to learn, however, to see and treasure these winks from above, just like the man with the concentrated gaze in the painting. Even though the sun casts its rays across the canvas, the sky is not serenely blue but filled with menacing stripes. The butterfly on the hands of the man does not after all mean that there will be no more hardship and sorrow, just like the birth of the Christ Child does not yet mean deliverance from our present brokenness. But the butterfly and the baby in the manger do act as signs that can help keep awake our hope for Christ’s return. When we look closely at the painting, we see several butterflies shooting through the air. Jesus comes to us in all kinds of unexpected tokens. Let’s keep our eyes open: the sky is full of butterflies. 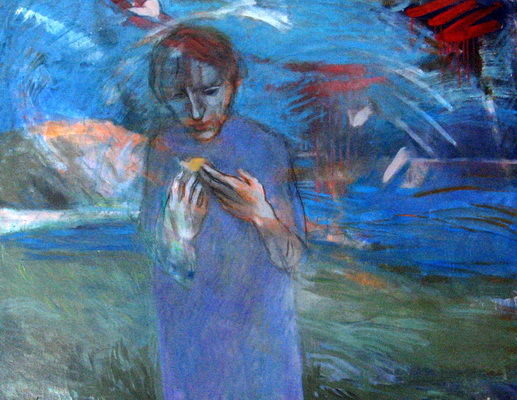 Anna Mgaloblishvili: Butterfly, oil on canvas, 110 x 85 cm, 1996. Anna Mgaloblishvili is a Georgian painter and art historian. She studied painting at the I. Nikoladze Art College and the Tbilisi State Academy of Fine Arts, where she was part of a group of students who established an experimental studio of Church Murals and Icons. It was one of the first attempts to bring ecclesiastical art into the university after the fall of the Soviet rule in Georgia. She has regularly participated in exhibitions in Georgia and abroad and has curated several art projects. She has taught painting at the I. Nikoladze Art College, worked as an illustrator with various magazines and as scientific researcher at the G. Chubinashvili Institute of Georgian Art History. In 2004 she received her Ph.D. in art history. Her thesis was about the development of church painting in Georgia at the beginning of the 20th century (1900-1921). Her study made a comparative analysis of Georgian church painting and the traditions of other Orthodox countries (Greece, Russia). Presently she is Professor of of Art History and Art Theory at the Tbilisi State Academy of Arts and since 2008 she has been one of the supervisors of the research project on Religious Art in the Modern World. For her work, see www.gallery9.ge/artists/ana_mgaloblishvili.html and http://www.art.gov.ge/artists.php?lang=En&artist=82.